First off, let me start by saying I can’t believe that it has been a month since my last post. What started as a brief hiatus as I dealt with other things turned into a longer break as I’ve struggled with finding the motivation for photography (you might think photo editing gets easier when you have a huge backlog of shots to edit, but I’ve found that makes the task more daunting and seem insurmountable…but woe, is me, right?). 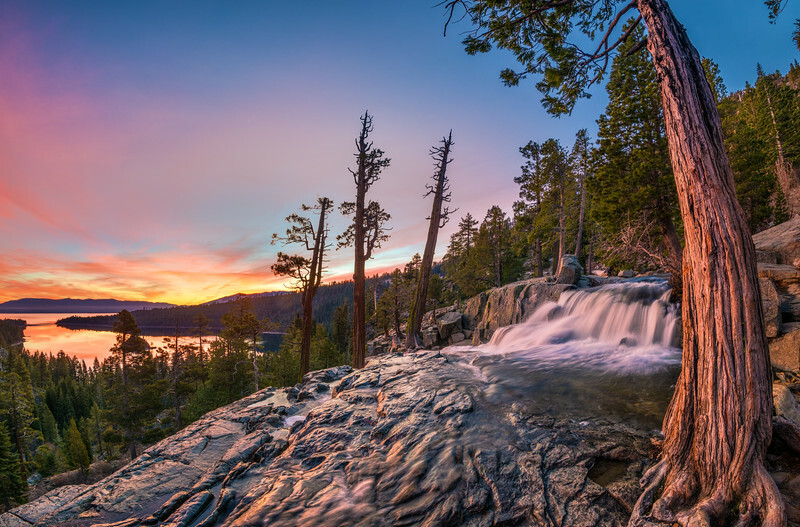 In any case, these are all simply excuses, and I’ve wanted to get back into the swing of things, and the only way to do that is by doing, so here I am with this quick post from a couple visits to Lake Tahoe. The second was totally unplanned. We started out for Yosemite National Park because the forecast called for a 100% chance of snow on the Valley floor, with 5 inches expected. I don’t know if weather forecasters understand what 100% means, but in the real world, it means that the predicted event will, without exception, occur. As we stood in a snowless Yosemite and watched the forecast plummet as we refreshed our phones to <30% chance of snow, we quickly evaluated our options. We could roll the dice and hope for some luck in Yosemite, or we could bail and go on the type of wild goose chase that has become the hallmark of these trips. As we zoomed out on the radar, it hit us both, almost simultaneously. Tahoe. In a normal conversation, this idea would have been quickly laughed off as something fun to do, but altogether impractical given the constraints of the “real world.” We had already driven 6 hours to Yosemite, and Lake Tahoe was another 5 hours away. Plus, it actually was snowing at Lake Tahoe, meaning difficult driving conditions in the middle of the night…in a Prius. Had you told us it would be snowing in less than two weeks on our previous visit to Lake Tahoe, we probably would have laughed. 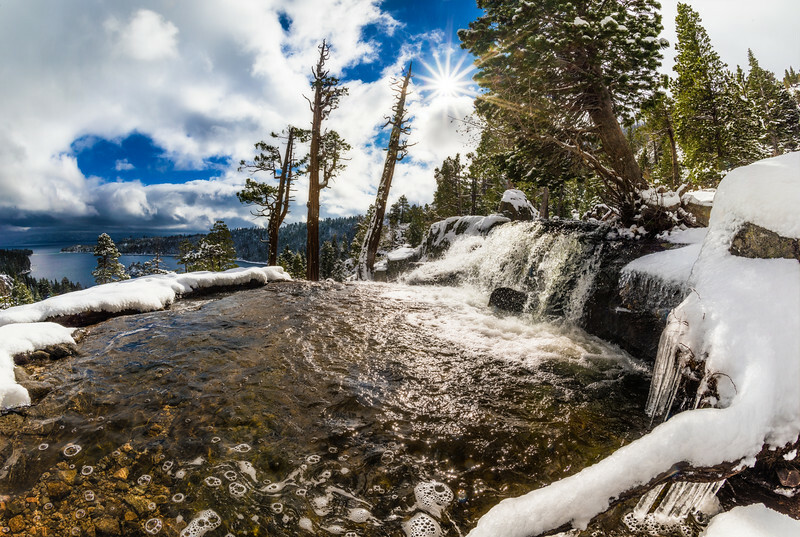 As we enjoyed record high temperatures, we heard locals lament the unseasonably warm weather, and the negative impact that it had on tourism (Lake Tahoe is a popular ski destination) that winter. Purportedly, it was shaping up to be the warmest February on record, and although this made for some nice shooting conditions–I probably could pass the photos here off as being taken 6 months apart–the weather was debilitating for the businesses that relied upon winter weather. The morning–and day as a whole, really–at Lake Tahoe ended up being a great light chase, bouncing from spot to spot trying to capture as many unique locations as possible. I’ll cover the rest of the adventure in due course, but for now let’s jump ahead to that second trip. After the lengthy commute and stopping to put snow chains on the Prius, we killed some time with a 7-11 stop and a nap break before preparing for the sunrise over Lake Tahoe. There was fairly thick cloud cover, so we waited. And waited. While we were able to drive our way to snowy weather, we were unable to drive our way to perfect photo conditions–the best laid plans of mice and men, and all that. 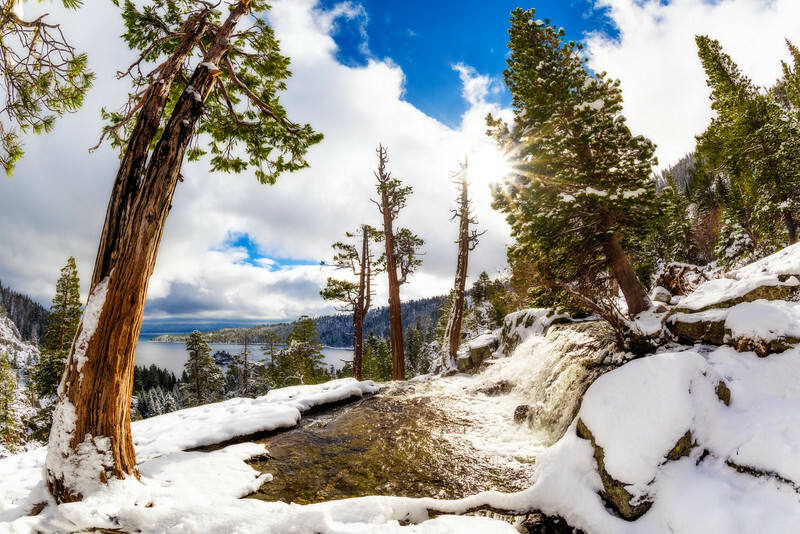 Finally, about an hour after official sunrise time, the clouds broke and the sun illuminated Eagle Falls and all of the snow-covered trees around Emerald Bay. It was a stunning sight, and although we didn’t get a proper sunrise, we both commented on how it was nice to go for a little “diversity” with a post-sunrise bright blue sky shot. For these photos, I used my a Nikon D810 and Rokinon 12mm f/2.8 Fisheye, plus my MeFoto travel tripod. If you’re planning a California road trip or vacation, check out my California category of posts for other things to see and do. To get some more photo ideas, check out my Northern California Photo Gallery, which includes additional shots I have taken up north. For photo licensing inquires, please contact me. 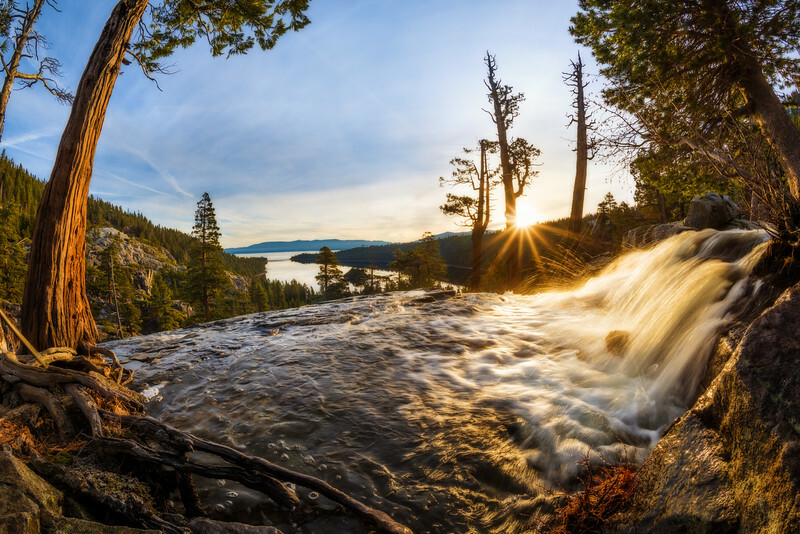 Have you visited Lake Tahoe? During which season? Do you share our enthusiasm for wild goose chases? 😉 Share your thoughts on this or anything else, or questions you have in the comments! I am glad you trekked through snow for this shot! I went in September 2013 & Eagle Falls was dry! No water at all! Emerald Falls is gorgeous at sunrise! I hope you had a chance to hike down to the house that sits on the water’s edge of Emerald Bay. I do not remember the name of the house. I need a banner for a volunteer Bioblitz on iNaturalist next spring. Do you mind if I use one of these? Thanks! FYI, I found you through an article that gave your photo CC attribution, not all rights (yours is slide #8). Go for it, and thanks for the heads up! Not sure why this isn’t getting more “love” on this post. Stellar images and great story. We are headed out West this summer and we had this area in our radar but some beach time in San Diego won out with the family. We are still headed to Yosemite and other parts of CA but this makes me sad that I will miss such beauty. I’ve been waiting for your Tahoe installment, and you did not disappoint! It’s amazing to look at those shots and realize that they were really only two weeks apart. The lack of sleep and crazy mileage were totally worth it, IMO. Looking forward to seeing the rest! Beautiful shots, although the bendy trees with the fisheye are not my style. We’ll get out there sometime! I’ve always wanted to visit Yosemite and your photos have only heightened that desire.